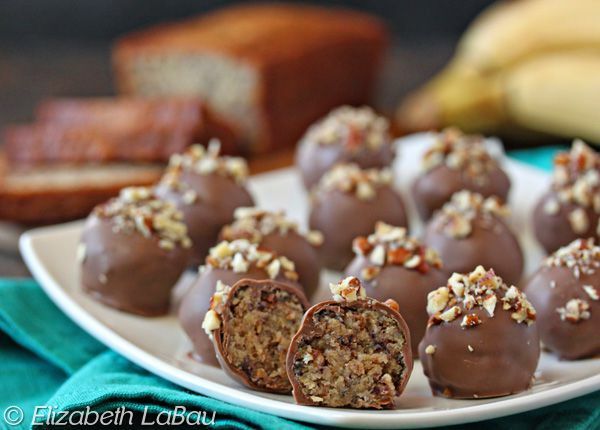 Banana Bread Truffles are made from banana bread, so they taste like banana bread! These moist bite-sized candies are dipped in chocolate and topped with a pinch of chopped pecans, for a delicious treat that's good as an afternoon snack or an after-dinner dessert. You can use either homemade or store-bought banana bread for this recipe. If you're new to making cake truffles, don't miss this step-by-step cake truffle tutorial. The ingredients are slightly different, but the method of making and dipping the truffles is the same. Crumble the banana bread into a large bowl and work it between your hands until it is in small pieces. Add 1/2 cup of the frosting into the bowl and stir it with a rubber spatula until the mixture is well-combined. It should be very moist and hold together if you squeeze a ball of it between your fingers, but not too wet or greasy. Depending on the texture of your banana bread, you may need to add up to 1/2 cup more frosting to get it to the desired consistency. Using a small cookie or candy scoop, scoop out small 1-inch balls of candy and roll them between your palms until they are round. Place the truffles on a baking sheet covered with waxed paper, and refrigerate them until they're chilled. They won't get hard, but they will firm up a little. The truffles can be made in advance and kept covered in the refrigerator for several days until you're ready to dip them. When you're ready to dip them, place the candy coating in a medium microwave-safe bowl and microwave it until melted, stirring after every 30 seconds to prevent overheating. Stir until the coating is melted and smooth. Using dipping tools or a fork, submerge a ball in the melted candy coating. Remove it from the coating and let the excess drip back into the bowl. Replace the dipped truffle on the baking sheet. Top it with a pinch of chopped pecans while the coating is still wet. Repeat with the remaining banana bread balls. Refrigerate the truffles to set the coating completely, about 20 minutes. These Banana Bread Truffles are best served at room temperature, and can be stored in an airtight container in the refrigerator for up to a week.